You might not be able to tell the difference between a nurse who’s late for work and a suicide bomber, but soon surveillance cameras might be able to, says the New Scientist. Cameras are already making use of recognition technology to recognise faces and smiles. Where consumer laptops and mobiles use this facility for fun, video surveillance experts are hoping to use it for more serious purposes. Like catching criminals or terrorists in airports or train stations. Researches in the UK are developing a next-generation CCTV system, called Samurai, which is capable of identifying and tracking individuals that act suspiciously in crowded public spaces. And how does the camera know if you’re acting suspiciously? Samurai uses algorithms to profile people’s behaviour, learning about how people usually behave in the environments where it is deployed. It can also take changes in lighting conditions into account, enabling it to track people as they move from one camera’s viewing field to another. 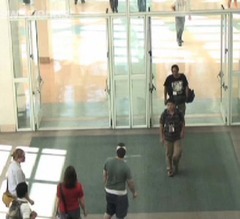 It learns the most common routes people take and can follow one person in a crowded room. Current CCTV systems can collect masses of data, but little of it is used, says Shaogang Gong, a computer-vision computation researcher at Queen Mary, University of London. “What we really need are better ways to mine that data,” he says. Gulp. I’m part impressed, part terrified. Judging human behaviour with alogorthyms is slightly terrifying prospect and I just feel sorry for anyone who has got a funny walk.